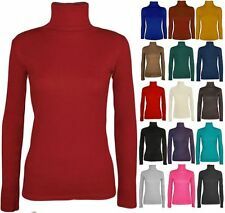 NEXT BLACK WOOL JUMPER, CROSS OVER BACK DETAIL SIZE UK 14. Condition is New with tags. Please check out my other items as having a clear out. Happy to combine postage. Thanks for looking! Dispatched with Royal Mail 2nd Class. MALOKA NATURAL PURE LINEN TOP SIZE 16/18 Beautiful loose top ,cool for summer, looks good layered NWT. Condition is New with tags. Banned Apparel Folded Bolero Shrug. Bolero only, does not include top seen in picture! Described as 'Tropical Green' which is blue toned green. XS- fit size 8. Will also fit a 10 to small 12. -I describe to best of my ability but I am human. 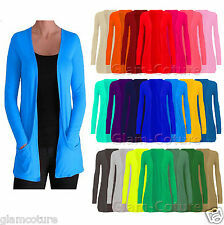 Ladies NEW Open Front Cardigan Casual Long Sleeve Smart Jacket Sweater Coat Top. LONG SLEEVE LIGHTWEIGHT BOYFRIEND CARDIGAN. COBALT BLUE. MACHINE WASHABLE. BY YOUR STYLE. 21" APPROX. 100% VISCOSE. 30.5" APPROX. UNDERARM TO UNDERARM. 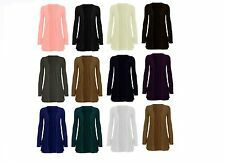 Ladies Women Plain Batwing Oversized Long Sleeve Baggy Sweater Jumper Top 8-26. WOW FAB NEW WITH TAGS MISS SELFRIDGE CARDIGAN SIZE 16 LOOK!